There are certain places you expect a tasting, of any kind, to be held at. 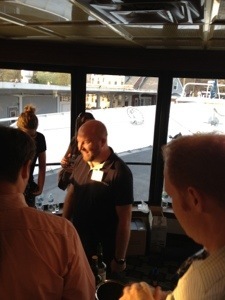 Nice hotels, private clubs, resorts, etc… The Whisky Guild hosts tastings on boats. In Washington D.C. they use a fairly large vessel that comfortably holds hundreds of people. There are two tickets, a VIP which pre-boards an hour early and then a regular attendee. The tickets include a dinner and quite a lot of whisky. The boat really does it for me honestly, I just love boats and drinking on a boat seems as natural as breathing to me. I go with the VIP because I’m always hoping something rare or special shows up from one of the distributors and being an hour ahead of the regular crowd has its benefits. Well, I think that all boarding early this year got me was more whisky. Problem? No, well, yes, it’s not like there is a lack of whisky on this boat! I was a little disheartened, though I knew ahead of time, that there wouldn’t be any rare whisky there. There was some very nice people there though. The Highland Park table featured very good whisky and great camaraderie. The “rock star” table for me was the one with Ewan Morgan of Diageo. Ewan is an Ambassador for Diageo North America and was a great conversationalist despite being tired from travels and two big shows that had taken him back and forth from East coast to West Coast. Unfortunately this event happens after two weeks of big shows in the States and many of the distributors do not send their “A” team. I’m referring to the Brand Ambassadors who are the foremost experts on their products. Also, many notable brands just didn’t show up. 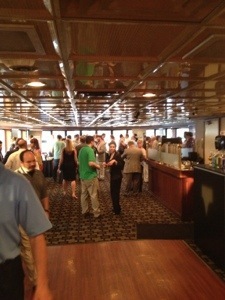 I should say that I was surprised at the amount of American whiskies on the boat. I always thought this to be a scotch whisky event but this year I swear 30-40% of the exhibitors were there with American whiskies. I think they were rather surprised themselves, I do believe the buzz was primarily at the Scotch whisky tables. 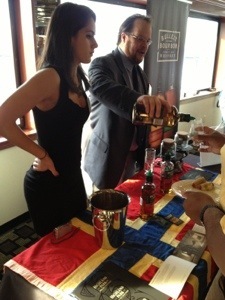 I came away with two great impressions from whisky that I have not had prior to the event. 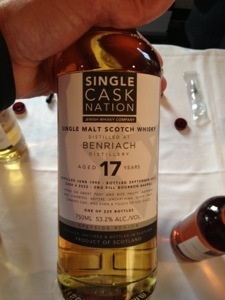 First I met the Single Cask Nation. You can check them out, I really liked their offerings and have seen much press about them as well as a blog they run. 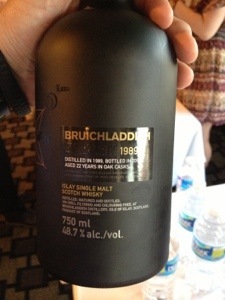 The star whisky of the night was from Bruichladdich. It was the Black Arts offering, aged 22 years, it was the most delicate, sophisticated and “special” dram of my evening. I had already enjoyed a bit of whisky before I’d arrived at a table that had the offering on it, and it still made a very big impression on my palate. I will be seeking this one out! It is a 22-year-old Oak aged beauty! Well, I enjoyed the cruise, I just wish it could be on the weekend, this middle of the week stuff kills me! See you next year? I’ve been curious about this event for quite some time. The New York cruise in particular. Glad to hear it was fun. And as far as the shortage of Brand Ambassadors, I suspect the same happens at the Philly Extravaganza event, i.e. marketing budgets must run short given that the Philly show comes after a couple of big events in New York. What did you have from Single Cask Nation? I’ve had all three of their current offerings and was really really impressed with the Arran Pinot Cask most of all. Delightful stuff! The three guys that run the company are super nice guys too. I actually had the three current offerings, assuming that’s what they were, and I was impressed by each of them. The two guys at the booth were actually members, not from the company itself. They did a great job and you can tell they were very enthusiastic about the product. As for the event, I will probably always go, but it could be a lot better. Ah nice! All three (Arran, Benriach, and Kilchoman) are excellent. Makes me want to consider membership.